Your exterior signage should be a natural extension of your brand and business. To make them simply impossible to ignore, you need to go big on their size. But focusing just on size won’t cut the deal. You need to emphasize on a simple and yet effective design and content too, which are tailored to fit your business identity and convey the desired message at a glance. Having created business signs with impact for various industries, this time at Citrus Sign Studio, we did it successfully for Academy Bus. Our client Academy Bus – a leading bus company, which has been serving the Northeast region of the US for more than 40 years, was growing its business in the Orlando market. They needed new outdoor signage for business that could be put up beside busy roads and displayed the company contact details (both phone number and website) clearly together with the name and logo of the business. Their belief about the size of the signs was summed up cleverly in these few words: Bigger is better! Quick Message Identification: To help people know the message quickly. Short Copy: The content should be simple and easy to remember. Cut the Jumble: Based on the popular adage: Less is more, our focus was to create a simple exterior sign that would deliver a great impact. Images and Colors: While any image or logo used needed to be big enough to grab the attention of onlookers, the color coordination should be such that the main message isn’t lost in the surrounding design or colors. Layout: All design elements needed to form a single cohesive unit rather than stick out as sore thumbs. Simple Background: We needed a simple background that wouldn’t interfere with the message. Once the basics were decided upon, we focused on creating a clean, easy-to-read and effective exterior signage design that would become visible from a distance. By featuring the business name next to its logo in bold black letters against a soft gray background on the 28’W x 8’H sign, we made sure it got noticed. The company phone number and website address were placed just beneath in white against a contrasting black background to stand out from the rest of the signage and help the interested parties get in touch without any delay. With its clean, sleek look, we focused on grabbing people’s attention and outshining the competition. 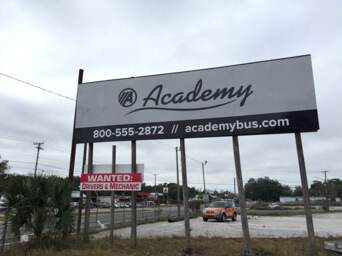 Once the design of the exterior signage was finalized and approved by the client, Citrus Sign Studio created the sign panels for the new business location of Academy Bus and installed the two new signs to promote it. 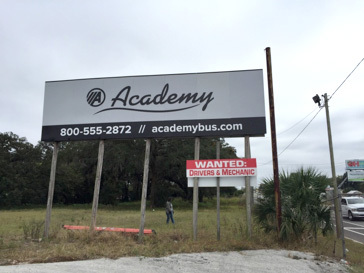 Impressed by our professional billboard design, uncompromised quality assurance, competitive pricing and personalized service, Academy Bus did have a few words of praise for Citrus Sign Studio. We don’t brag but this project was indeed a success story for our entire team that gave us immense satisfaction. If you too need custom outdoor signs for your business that packs a punch for your brand, reach us today at 321.285.0730.